Museum of the Bible began its journey to create a Bible museum in 2010. The goal was clear, but how it would materialize we could have never foreseen. Our project has grown far grander than a single building in a strategic location. 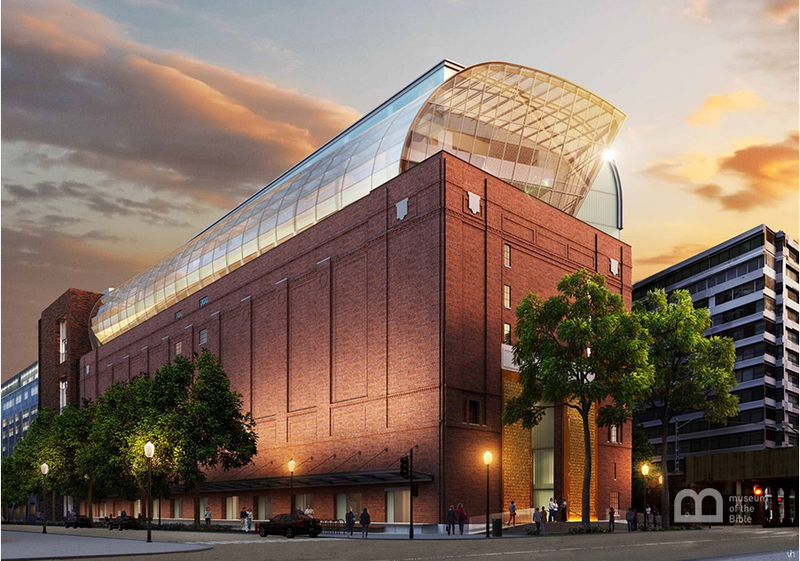 Since its beginning, four key initiatives have forged the path in taking the Bible all over the world, and ultimately to Washington, DC, where the Museum of the Bible will open its doors in the fall of 2017. More than 60 universities around the world are currently participating in our Scholars Initiative projects. 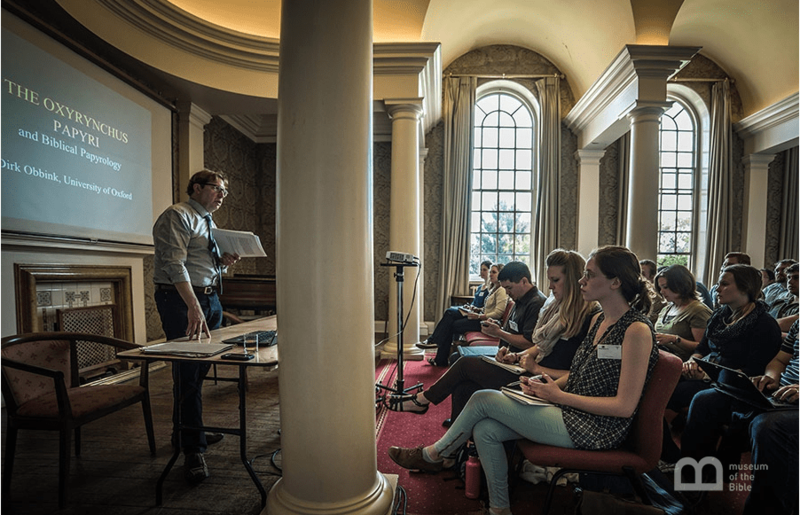 Through the Scholars Initiative, young scholars work with some of the world’s foremost textual scholars, and pioneer new research on items within the museum’s collection. 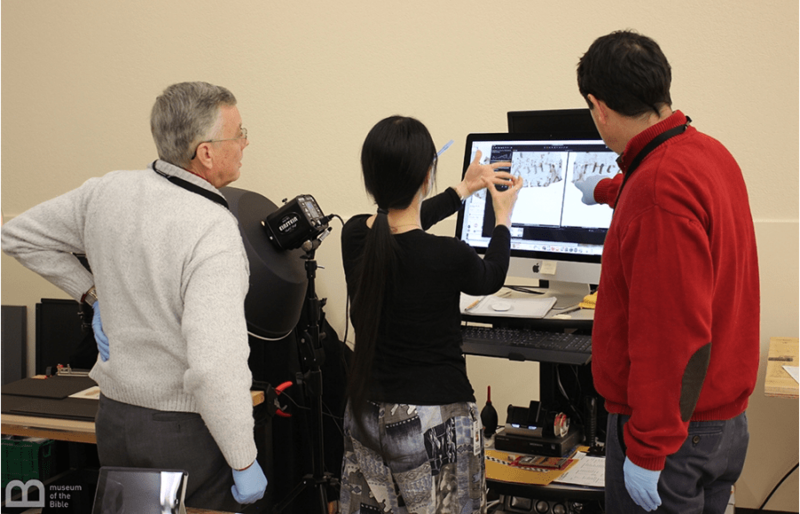 When we first acquired an ancient document known as the Codex Climaci Rescriptus from Cambridge University, we used a multispectral imaging technology developed by Oxford University to pull out the underlying texts to better understand the context of the Bible in its ancient form. This research is invaluable to the vision of the project as a whole. All that is discovered through research serves to bring guests of the museum into the historical context of the Bible. Simply put, the research provides information useful for understanding the transmission of the Bible through time. The stories told by our collection are central to Museum of the Bible. We knew that it would be years before a museum building could be constructed, and we simply couldn’t wait to tell the stories contained within our increasing collection of artifacts. Passages, was our first traveling exhibit. It launched in Oklahoma City in 2011 to commemorate the 400th anniversary of the King James Version of the Bible. And our exhibits have continued to carry the story of the Bible around the United States and to other countries ever since. Verbum Domini (Latin for “Word of the Lord”) and Verbum Domini II exhibits went to the Vatican. 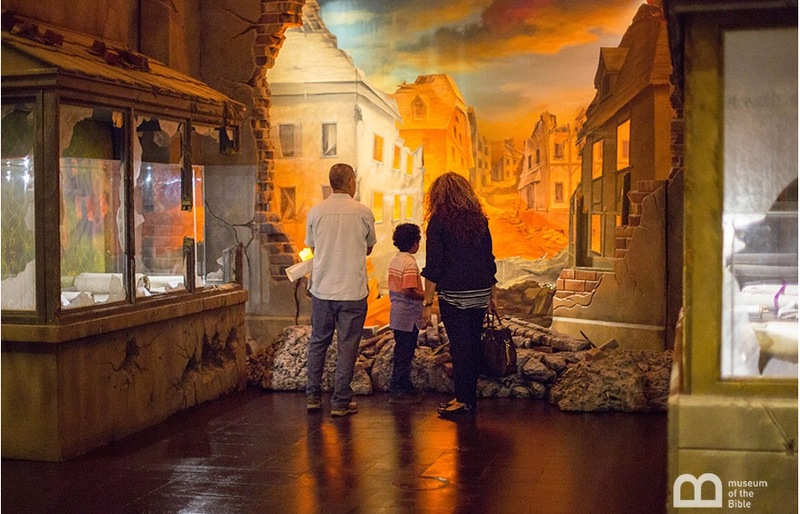 The La Biblia exhibit was first displayed in Havana, Cuba, where Catholics and Protestants came together to present a narrative of the Bible through various artistic expressions, such as acting and orchestral music to complement the story told by the artifacts. La Biblia was in Cuba for a second time, in Santiago, from February to April. Our exhibits have traveled to different international locations, and take on different themes. In 2013, we took an exhibit to Israel, and it remained there by extended invitation through the following year. We’ve made stops at numerous universities with our Sacra Pagina (Latin for “The Sacred Page”) exhibit, and have plans to be in Germany in 2017 to commemorate the 500th anniversary of the Protestant Reformation. Always the centerpiece of our plans, we open the doors to a 430,000-square-foot non-profit museum in the fall of 2017. The building, located just a few city blocks from the U.S. Capitol, will be an immersive and sensory experience designed to bring the Bible to life. Eight stories tall, the museum will feature three distinct floors: the Narratives of the Bible floor, which includes the World of Jesus of Nazareth, the History of the Bible floor, and the Impact of the Bible floor. Other areas will include exhibitions from the Vatican Museum and Israel Antiquities Authority who will display exclusive artifacts not available to the public in any other location. Another intentional design feature will be an electric screen ceiling in the nearby Metro rail station, which will attract the hundreds of people using public transit every day. The ultimate vision is to allow people all across the world the chance to engage in the history and story of the Bible. Beyond research, travelling exhibits, and the physical museum is our fourth foundational initiative – education. We have developed a curriculum for private schools and homeschoolers focused on simply presenting the Bible descriptively as it is and its incredible history and impact. In other words, the curriculum allows the Bible to speak for itself! Over the last two years, and with approval from Israel’s Minister of Education, over 5,000 students throughout Israel have used a Hebrew edition of the curriculum. Two regions in Israel are even hosted a Youth Bible Quiz competition! In addition, our interactive curriculum for high schoolers has been released to private schools and homeschoolers throughout the U.S. The journey we set out on in 2010 has grown far broader than the building that is currently under construction in Washington, DC. It has expanded into a multifaceted adventure that is allowing us to fulfill our dream of taking the Bible to the world. The scope of this project is not daunting because the more we dig and the more we research, the more we want all people to engage with this Book. 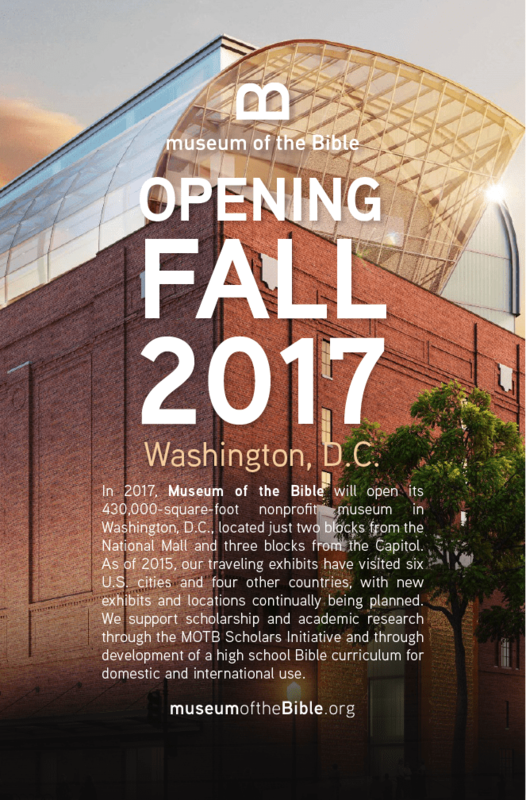 We are excited to bring the Bible to the world through all of the initiatives and efforts that comprise Museum of the Bible. Learn more at www.museumoftheBible.org. What do Millennials really think about the Bible? 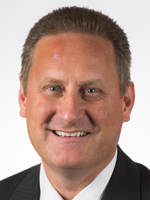 Steve Green serves as chairman of th e board of Museum of the Bible and is the visionary leader in establishing one of the world’s largest private collections of rare biblical artifacts, known as the Green Collection. In his role as chairman, Green has assembled a team of academics, designers, technology professionals and other experts to create the 430,000-square-foot Museum of the Bible, dedicated to a scholarly and engaging presentation of the Bible’s impact, history and narrative. It is scheduled to open in 2017 in Washington, three blocks from the U.S. Capitol.